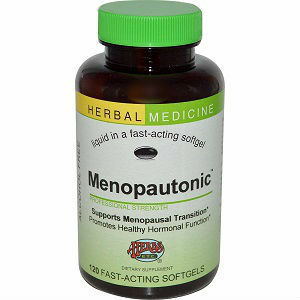 Menopautonic is an all natural, herbal supplement indicated for the relief of menopause symptoms such as hot flashes, sweats, back pain, and frequent urination. As with all herbal supplements that make claims of beneficence, we decided a little more research was needed. Vitex berry- Vitex berry is used to treat PMS and PMDD. Dong Quai cured root- Dong Quai has shown insufficient evidence for reducing symptoms of PMS. Hawthorn- There is insufficient evidence showing that Hawthorn can help with anxiety. Motherwort herb- Motherwort has been shown to help with sleep. Licorice root- Licorice root can help with Chronic fatigue syndrome. The recommended dosage for Menopautonic is one softgel with water in the morning and one softgel before bed. The price of one bottle of Menopautonic costs $26.78. Each bottle of Menopautonic contains a total of 60 softgels. Throughout our research, we determined (through lack of any documentation about the supplement or the manufacturers policies) that Menopautonic comes with no known guarantee. Menopautonic does include some helpful ingredients, however its ingredients are not clinically tested or proven to be beneficent or effective for menopause symptom relief. It comes with no guarantee, neither stated or implied. Jackie Horowitz	reviewed Herbs Etc. Menopautonic	on March 11th	 and gave it a rating of 2.